If enthusiastic response is any indication, then TRX – TURBOS 2000 was a huge success. On Friday June 23rd, perfect 70-degree weather greeted Turbo riders arriving from Minnesota to Milford (the next town over). The Jersey Boys, Mike Chestnut, and the Steve Smith Gang arrived early Friday afternoon and took advantage of the weather with a high speed/high mileage (200+ miles) ride that was a preview of Saturday’s route. These “Go Fast Boys” instinctively sniffed out the best roads without any help from me. They explored the back roads of northeast Pennsylvania on Routes 191 and 97 almost all the way to Saturday’s lunch destination in Hancock, New York. every minute of lost sleep. On Saturday morning, the Go Fast Boys picked up where they had left off on Friday by passing the first turn to the lunch stop at triple digit speeds. Turbo News Editor Steve Klose commented that it sounded like a World Superbike Race when they blew by him. The “Go Slow Guys” followed the route sheet and managed to beat the Go Fast Boys to lunch in Hancock, New York. After some delicious home cooking, the Go Slow Guys got an advisable head start on the Go Fast Boys. Halfway back to the Comfort Inn, the Go Fast Boys, lead by Andy Christensen on his CX500TC, blasted by the Go Slow Guys on a double solidly striped blind uphill turn head on into the path of the local sheriff. Ol’ Smokey was so shocked by the sight of a dozen bikes at triple digit speeds, he didn’t even try a pursuit. Near Port Jervis, everyone stopped at the scenic Hawk’s Nest Cafe to give themselves and their Turbos a cool down. Refreshments, ice cream, and tall tales were served while overlooking the Delaware River while back in Port Jervis, a few stragglers arrived to join the Turbo Party. Steve Fenton, from Clifton Forge, Virginia thought the Turbo Rally was worth investigating so he fired up his CX650TD and took an afternoon ride to Port Jervis. So did “Bob” from Berkeley Springs, West Virginia. 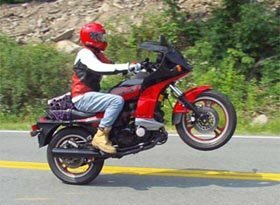 He thought riding to Port Jervis was a good idea and his Gpz Turbo proved to be the perfect vehicle to quickly consume the miles. Local guys Herb Southall (Gpz), Mike Clark (Gpz) and Robert Girsch (XJ Turbo) also arrived on Saturday. Saturday evening was highlighted by the efforts of Colin Goodall who organized the group photo session. Afterwards, it was a subdued evening of parking lot conversation due, I suspect, to adrenaline depletion. At 9:00 p.m., with most of the major players gathered in the parking lot, trophies and certificates were awarded. Even before it was all over, dozens of Turbo owners were asking when and where next year’s rally would be held. 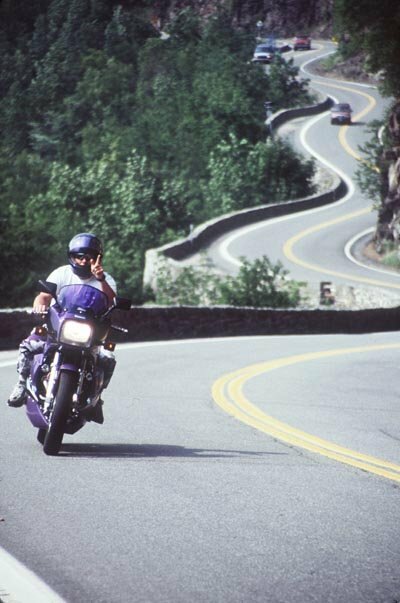 I’m pleased to announce that past TMIOA Director and Turbo News Editor Allen Lough has offered to host next year’s Turbo Rally, TR12 in the beautiful Shenandoah Valley of Virginia the fourth weekend in June. Thanks, Allan. I’d also like to thank everyone who attended and especially Steve Klose, Steve Smith, Mike Chestnut, Colin Goodall, and The Jersey Boys for making TRX another memorable event. I’ll see you there next year, won’t I? “Bob” (Berkley Springs, WV. ), Mike Chestnut (Gallitin, TN. ), Mike Clark (Milford, PA.), Ken Develder (Newark, NY. ), Justin Dinshah (Vineland, NJ. ), Glen and Kathy Edwards (Brighton, MI. ), John Ey, Sr. (Colora, MD. ), Mike Maurer (Philadelphia, PA.), Mort Milne (Danboro, PA.), Dan Palmucci (Kingston, NY. ), John Skokan (Willowick, OH. ), Steve Smith (Feasterville, PA.), Herb Southall (Newark, NJ. ), Roger Twito (Albert Lea, MN. ), Matt Venezio (Fort Lee, NJ.). Andy Ellis (Lodyard, CT.) CBR900RR, Steve Haft (Atlantic Beach, FL.) VF1000F, Gary Kleppe (Feasterville, PA.) ?, Richard Pohl and Laura Skokan (Mentor, OH.) ZX12R, Damon Raimondi (Edgewater, NJ.) 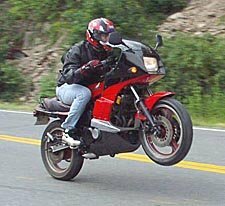 GXSR750, Mystery Duck (NJ) Ducati 916. The 2000 Rally X in Port Jervis was great fun. 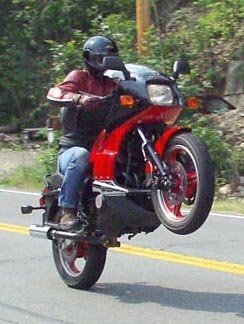 One of the many highlights was the impromptu wheelie contest held outside the Hawks Nest. Here is Mike Chestnut, Justin Dinshah and Roger Twito showing us what the bottom of the front wheel looks like.